Change can be daunting, especially changing a key and core element of your home. You want to paint the wall blue, but you don’t. Your inner designer has all these bold and daring ideas, but when it comes down to it, you shy away and decide to stay in the comfort zone of ‘off white’. Jasmine white, orchid white, eggshell, vanilla. But help is at hand! All it takes is a bit of TLC, a lick of paint or a splash of colour to really transform a boring old kitchen into a stylish, contemporary space that you can be proud of. I’ve put together this post to share 5 small and achievable changes to make a big difference in your kitchen. This is an easy, and possibly DIY, way to introduce some energy into your kitchen without going overboard. Using a bold statement colour can really transform a space, and bring some personality into an otherwise simple kitchen. Although it is all down to personal preference, navy is a great choice, as it compliments a vast variety of colours and textures. Blue is commonly associated with royalty and wealth, but you don’t have to be rich and famous to get a decent tin of navy paint! Introducing dark colours can be risky when it comes to rejuvenating a space- consider its size and the amount of natural light it receives. 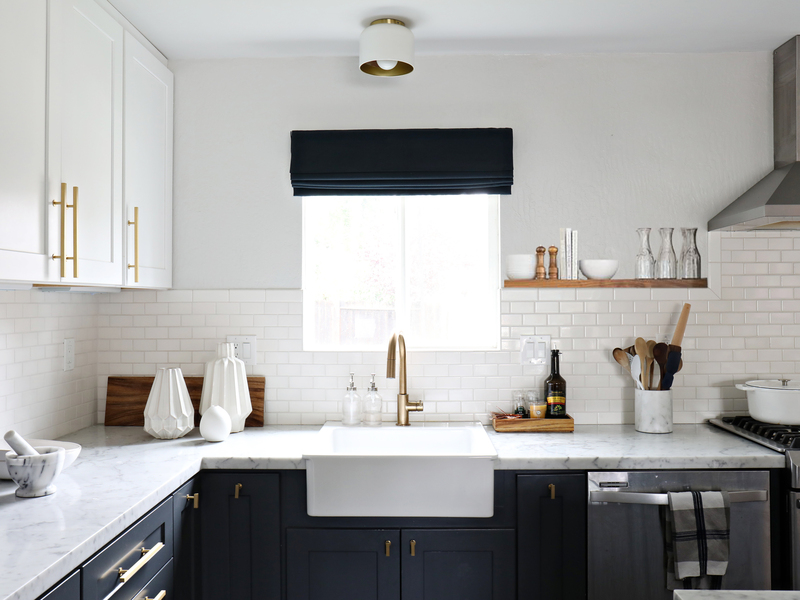 If the kitchen is a small area with little to no natural light, strong colours such as navy will only add to the dimness, causing the space to appear smaller and uninviting. Having said this, creating zones in your kitchen to help break up light and dark can really open up the area, therefore, if your kitchen is small, or you’re worried about making it look gloomy, keep the darker tones low! Having light paint or tiles around and above windows almost tricks the mind into thinking that the natural light beaming through has been extended, creating a brighter and more welcoming environment. You can use any colour, make it personal to you. This is a fun way to create a sense of luxury for a fraction of the price, restyling your kitchen into a vibrant and impressive heart of the home. For extra bold points, use oranges for smaller details to help really accentuate the darker tones in the space. Patterns are thought of as the ‘skeleton’ that arranges an interior, but just like the use of dark colours, it can easily be overdone. Using pattern in moderation can inject some identity into a space. 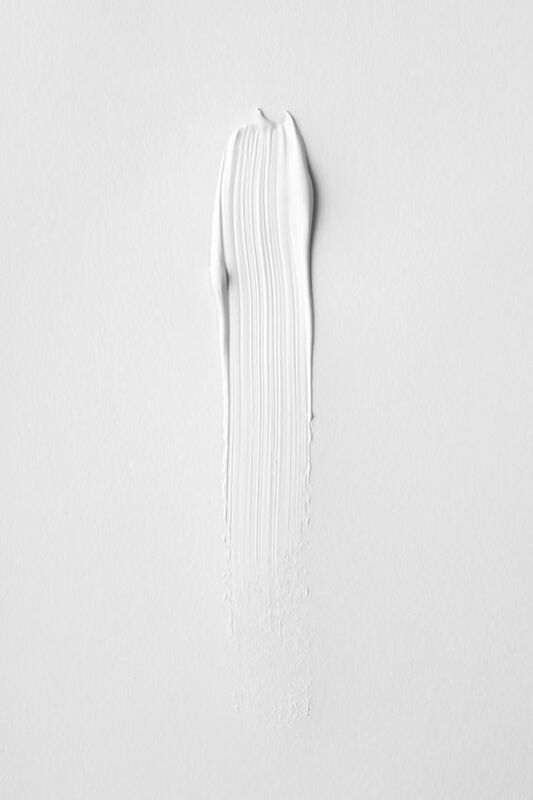 Repetitive forms create a degree of structure and consistency. Whether you’re someone who likes to pull together a large variety of textures, colours and design styles, or you’re into more modern designs and favour minimalism, the uniform nature of pattern can really help tie an area together, creating a sense of fluidity in your kitchen. 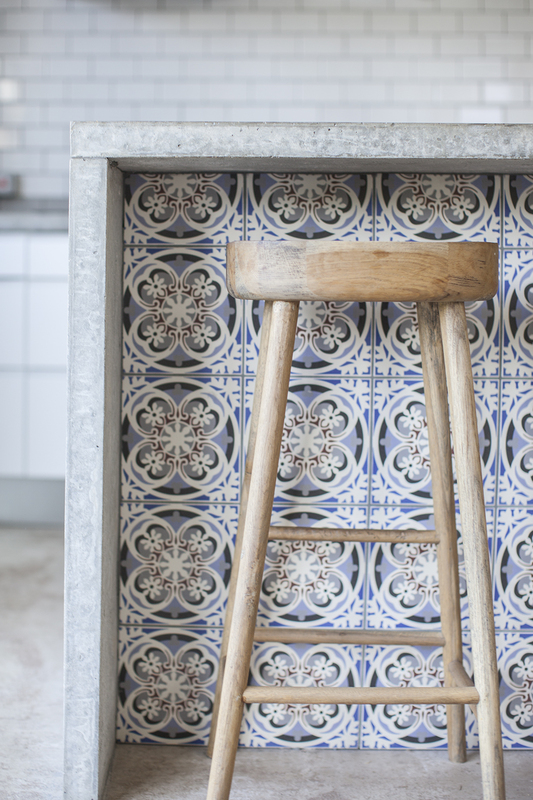 If used for a splash back, walls, or usually overlooked areas as seen here, patterned tiles can give your kitchen an interesting focal point and gently introduce you to experimenting more with design. For small areas, again, this is relatively inexpensive, and the possibilities are endless! There are hundreds upon hundreds of designs, ranging in colours, style, detail etc. so you are guaranteed to find the perfect match for you and your kitchen! As well as being pretty, it’s also helpful. When you’re desperately trying to fit in some much needed baking time, the last thing you want to think about is cleaning up the aftermath. Wall tiles make cleaning quick and easy, as a wipe down is all it takes to get your kitchen looking back in tip top condition again. A perfectly practical small change that makes a big a difference! Mismatching crockery and furniture seem to be a growing trend with many restaurants and pop-ups around London. The intention of this is to create a less commercial feel, and bring the mismatching chaotic vibes of the home into public spaces. No one really intends to have 4 odd mugs, but we do, and we love it that way! Using mixed furniture is an exciting way of introducing some drama and interesting forms into your kitchen, giving it a lease of life and a load more character. If you want to be really bold and daring, go all out! I’d recommend keeping some consistency, whether it’s through the use of similar chairs, or by homing in on a specific colour palette. You’d be so surprised at how many styles can be incorporated. By breaking up the uniformity you create a much more more welcoming environment. After all, you want your kitchen to be an inviting space, not a showroom. As long as you try and keep to having a degree of regularity, and you’re careful to make sure everyone is sitting at similar heights you can’t go wrong! Lighting! Given its obvious ability to transform a space by illuminating and making the overall atmosphere incredibly warm and welcoming, it also has a huge impact on the size of a space. Generally speaking, we tend to stick to standard options when we’re not entirely certain on what will work well or look good. Spotlights? Boring! So many other forms of lighting can be used to make your standard kitchen vibrant and impressive. Wall lights add length to an area, forming a sense of direction and creating an illusion of a larger space. Cabinet lighting can be as simple as small hidden LEDs, or even above glass doors, showing off your favourite ‘special occasion’ glasses that would otherwise be completely forgotten about! Centrally hanging lights can make a poorly lit room appear much larger in size, and it’s here that you can have fun with with style and design. 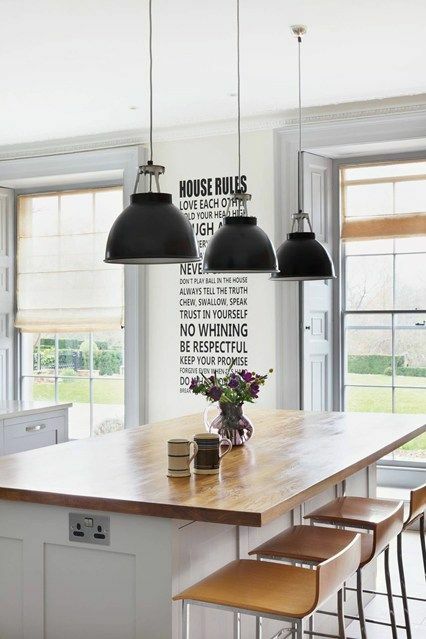 Low hanging pendant are most popular as they add so much interest and visual identity to the space, and whether above a countertop, central island, or seating area they create a great focal point that will bring your kitchen to life. Pinterest’s go-to storage option! Cupboards and kitchen cabinets let us to shove things in quickly and clumsily, slam them shut before everything falls out of the limited space, and run away. 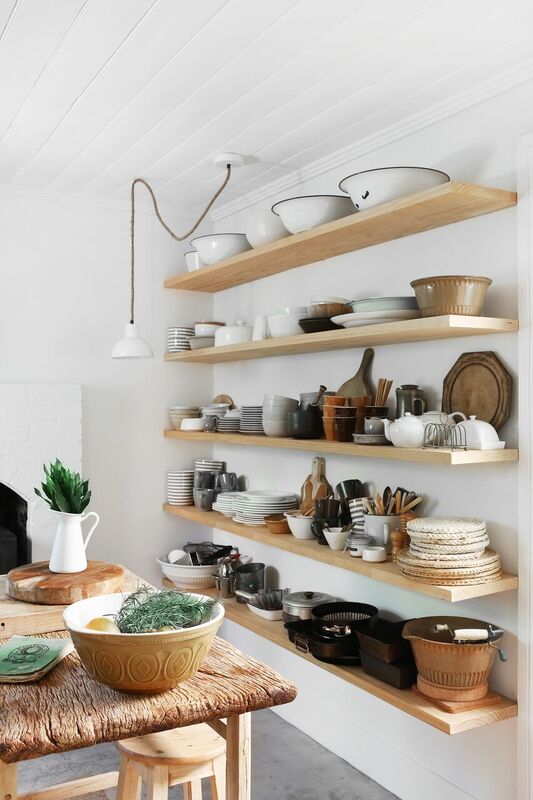 Open shelving creates a whole new layer of design to your kitchen, creating a much more open and cleverly utilised system, while also encouraging you to display all your favourite crockery. Don’t let the idea of dust put you off! Shelving creates a huge statement in your kitchen. Nothing welcomes a guest like the phrase ‘make yourself at home’, and with open shelving, they can do exactly that. There’s no awkward hunt for a mug or plate. Everything is in clear sight, bringing everyone together into the warm and friendly space that is your home. 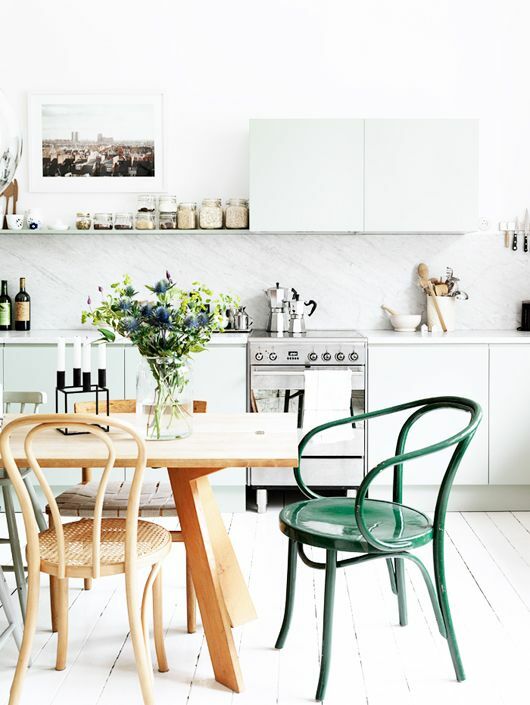 And there you have it – 5 small changes for a big difference in your kitchen. Comment below if you have any other simple and inexpensive ways to transform your home!